Mira Grant (also known as Seanan Mcguire) is having one of those very good years. 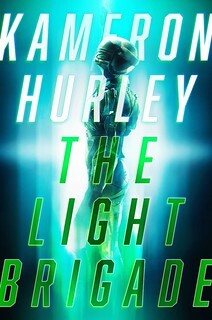 First, as Mcguire, she won last year’s Campbell Award for the best new writer in science fiction and fantasy. Then Feed, the first installment of her “Newsflesh” series (see last year’s Big Idea on it), was nominated for this year’s Hugo Award for Best Novel. And now Deadline, the second novel in the series, is in the stores, to pick up the neo-zombie goodness where it left off. And where do you go from zombies? Well. I’ll let the author tell you. So here we are again. The last time I visited the Big Idea, it was for Feed the first book in the Newsflesh trilogy. Now it’s Deadline, otherwise known as “you’ve survived the zombie apocalypse. What are you going to do now?” Hint: we’re not going to Disneyworld. The big idea behind Feed was “what if we survived the zombie apocalypse because popular culture told us what to watch for?” Well, in the year since Feed was published, the zombie has become ever more a part of the national consciousness. There’s a car commercial right now (it airs during Fringe, so I’ve seen it about eight times) that features a zombie businessman driving to work. They never say that he’s a zombie, but they don’t need to; we know what a zombie looks like. There’s a poplar line of fashion dolls called “Monster High” that features a cute zombie girl named Ghoulia Yelps—a character popular enough that this year’s San Diego Comic Convention exclusive is Ghoulia dressed up like a superhero. There are zombie jokes on our sitcoms and zombie comics in our comic book stores, and even zombie chocolate bunnies in our Easter baskets. The age of the zombie is here. We have a zombie apocalypse; that’s been established. Once the zombies are here, they’re not going anywhere; that’s been established, too, at great and sometimes painful length. So what happens to society? What happens to technology? And what happens to science—which is, after all the reason we have zombies in the first place? Thanks a lot, science. You made the mess. Now what are you going to do about it? Feed was a political science fiction thriller, centered on a presidential campaign. I didn’t have that option in Deadline; the results were in, we had a new man in the White House, and yes, that meant the campaign was over. Unless I wanted to skip forward four years, I needed another concept to build my frame around. Skipping forward four years would have given my rather traumatized protagonists too much time to recover, which would have made them a lot less fun to write. So I started casting around for other ideas…and my eye fell on all those lovely books about diseases and epidemiology and everything else that I’m not allowed to talk about at the dinner table. See, the virus which brought about the zombie apocalypse in my world was genetically engineered from several completely different families of virus, the filovirus (lit. “thread virus,” or “oh, crap, my insides are rapidly becoming my outsides virus”) and a spiffy little rhinovirus/coronavirus hybrid (lit. “nose virus” and “crown virus,” respectively, or the “I’m sorry, I can’t come to work today, I hab a code” viruses). This means that while it is now one pretty little infectuous agent, it has the behavioral patterns and desires of several different types of disease. It’s a chimera, Frankenstein’s virus, and like most monsters, it’s always going to do something you don’t expect. If Feed was the story of a society, Deadline was going to be the story of a disease. I am a research nut. My addiction to “Why?” was noted as early as age three, and has not lessened one little bit as time has gone on. I’ve just acquired more and better ways of learning things you don’t want me to talk about at the dinner table. I threw myself into researching the structure and behavior of disease, and the structure and behavior of the organizations which fight disease. I learned things I was happy about, and no one else wanted me to know, largely because I am also a fan of sharing. My editor, being a brave and valiant man, tolerated my gleeful burbling about yellow fever and patterns of infection, partially, I think, because he wanted to see how it would all come together. What would a totally artificial disease do, given free run of the human race? What adaptations would our immune systems make as our bodies tried to deal with the virus? Would it make any difference that our immune systems no longer needed to deal with cancer or colds? And in the same vein…after a generation or two, would pursuing a cure really be in our best interests, as a species? Sure, having the zombie virus does mean that eventually, you’ll get up and try to eat your family, but that’s a relatively rare occurrence. Suddenly finding yourself free of zombie virus, but also free of inherited immunities, and surrounded by all those carcinogens that we stopped worrying about when cancer went away…that could be more of an issue. Deadline also wound up being about psychological contagions, like fear, and paranoia, and greed. Who controls the spice controls life, according to Herbert; well, who controls the medical establishment controls everything, after the zombies start to rise. The surviving members of my cast from Feed aren’t exactly what you’d call “stable” these days, and playing with that gave me even more room to demonstrate the long-term impact of infection on a society. It’s just that this society happens to be ours. Actually, there really isn’t one. Follow Grant/Mcguire on Twitter. Visit her LiveJournal. Great timing! I didn’t know either that the sequel was here already or that Mira = Seanan, but I just finally started listening to the Feed audiobook this morning. Lots to look forward to, apparently, and it’s nice when sequels come along so promptly. I just finished Feed last week and really enjoyed it. 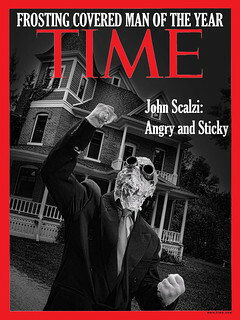 I plan to read Deadline after I finish this book by some guy named Scalzi. Feed rocked my world. When Deadline goes live (hah hah) tomorrow, I will have it downloaded to my Nook so fast I expect it to leave a smoke trail. How have I not heard about this author and series?! I’m so ashamed! I want to pick up the books asap! Mine might be here today! Half way though Feed (loving it) now so I can’t read the bulk of this Big Idea yet. Ordered Deadline anyway. “Feed” was a real pager-turner of the “must put book down now and go to sleep/work/dinner” sort. Very much looking forward to the sequel! I picked up Feed because of the Big Idea piece last year and I absolutely loved it. I’m excited to go pick it up and, as a fan of diseases (as much as one can be a fan), I’m now even more excited. Feed was great (as other commenters have noted); I didn’t realize Deadline was out, thanks for the head’s up. I love stories about disease and contagion – whether real or imaged diseases. ( Andromeda Strain, 28 Days Later (& Weeks Later), Outbreak, The Stand) You name it, they fascinate me. That’s why I’m so very disappointed *&* really excited that I missed Feed – ’cause now I get to read Feed, then Deadline, one right after the other. And then, of course, I get to wait for however long for the next book. I do have a new author to explore, though, so that’s pretty cool. I first heard of Feed thanks to your last appearance on The Big Idea and your book went straight into my top ten favourites. My copy of Deadline arrived in the post today and it’s made me very, very happy. I can’t wait to read it and start poking my friends to do the same. Note: They may contain some minor spoilers from Feed, if you can really be considered to be “spoiled” about events that occur twenty years in Feed’s backstory. I had just purchased Feed last week; planning on starting it tomorrow, so naturally I went ahead and bought the sequel in anticipation of enjoying the read. Well, I know what I’m adding to my Amazon shopping cart. Great post — very fun. Thanks for sharing this! Love Feed, love Seannan’s Toby Daye books, have been counting down the days til Deadline is released! I’m thrilled it’s finally here – the ending of Feed was such a shock to my system that I can’t wait to see where she’s going next! I just finished Feed last night. An amazing book I got turned onto after it was nominated for the Hugo this year. I will be picking up Deadline tonight for my iPad. Probably one of the more unique books I have read. Very visceral, technical and exciting along with very engaging characters. Highly recommended. Droewyn @ number 12, thank you for the link to Seannan’s page – that’s good reading! I generally don’t care for zombie or omg-pandemic novels, but the writing in Feed sucked me in instantly (via the last Big Idea), and I can’t recommend it enough. Looking forward to getting my copy of Deadline! I remember looking through books quite awhile back and being intrigued by Feed, but the zombie thing turned me off. Don’t get me wrong, I absolutely love zombies and vampires and have since I was a little kid (it’s just that they’re the current thing and are being overdone to death). I decided that was unfair to this author and bought Feed and the sequel tonight at B&N. Already halfway through Feed and loving it. Very well done and congrats. on your success. Would really like to know what would have happened to the hyena colony living in the Berkeley hills. Oh yeah, Zombie Hyenas. How awesome would THAT be? I’ve seen one chew through a cow femoral bone. Really like your writing in the action sequences. Do wonder, however, if the baddies ever think of trying something OTHER than outbreak attacks. Doesn’t appear as though that approach is particularly effective against this crew. Also, seems like Shaun would be aware that he’s got highly placed contacts in the White House. Why would it not occur to him to contact Rick?